In May 2018 I was invited to make a new work for Scaffold Gallery’s group exhibition There is No Such Thing as Boredom, at Paradise Works, Salford. 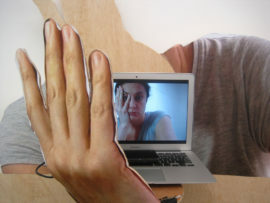 The work was a response to the provocation in the title of the show and took the form of a 9 minute film on a laptop supported by an enlarged hand and shoulders of the protagonist. The film pictures the protagonist stuck in front of the computer screen facing the viewer, perhaps waiting for a response from someone, or stuck looking at their workstation. The work explores the state of boredom through movements and actions, moving from a playful feel to exasperated gestures bordering on violence towards the self. 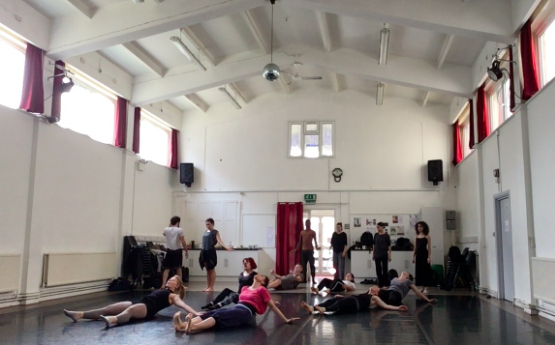 The film was created using expressive movement techniques honed through the training I carried out with Adrian Look.